The former president contrasted his wife with Donald Trump: "She never made fun of people with disabilities; she tried to empower them based on their abilities." 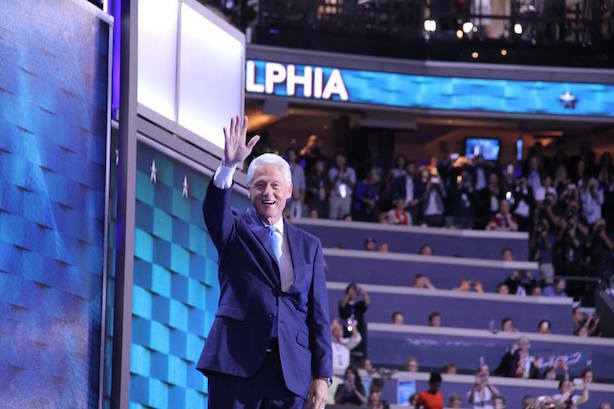 PHILADELPHIA: Former President Bill Clinton sought to humanize Democratic presidential nominee Hillary Clinton and paint her as a change agent during his Tuesday night address to the Democratic National Convention in Philadelphia. Clinton recounted his courtship of a fellow student named Hillary Rodham, as well as his three marriage proposal, life in Little Rock, Arkansas, and Washington, D.C., and dropping Chelsea Clinton off at Stanford University. He recapped the former secretary of state’s work on behalf of minority children and the disabled during the early part of her career, seeking to draw a contrast with Republican nominee Donald Trump, who mocked a disabled New York Times reporter at a campaign rally last year. "She never made fun of people with disabilities; she tried to empower them based on their abilities," the former president said. Clinton also countered Republican criticisms that his wife is the candidate of the establishment — GOP vice presidential nominee Mike Pence called her the "secretary of status quo" at the Republican convention last week — as Democratic delegates held up "change maker" signs. The former president recalled his wife’s work on education reforms while he was governor of Arkansas. "[Hillary Clinton is] the best darn change-maker I’ve ever met in my life," he said. "She always wants to move the ball forward; that’s just who she is." Clinton’s speech was a first on various levels. While former presidents routinely endorse candidates at national conventions, his was the first address on behalf of a spouse. He was also the first man to speak in the spot usually reserved for the current or prospective first lady. The second night of the Democratic convention followed the roll call of states, at the end of which Clinton was officially nominated by the convention delegates, making her the first woman put forward by a major party in a presidential race. In a symbolic gesture, former Democratic rival Bernie Sanders called for the delegates to suspend the rules and give Clinton the party’s nod in a voice vote. Some Sanders supporters walked out of Wells Fargo Center in protest. Other Tuesday night speakers included actresses Lena Dunham and America Ferrara, 9-11 survivor Lauren Manning, Sen. Amy Klobuchar (D-MN), and former Secretary of State Madeleine Albright. Alicia Keyes performed directly after Clinton spoke.